Grab bars are helpful for people of all abilities! Installing a grab bar is an inexpensive way to make your bathroom safer. There is always room to install grab bars in the bathroom. People of all ages and abilities benefit from using grab bars. Grab bars have become much more common in recent years and are generally available from major building supply and home medical equipment retailers. Traditionally grab bars have been associated with the disabled, however everyone can use them! People of all ages and abilities benefit from using grab bars. Grab bars help create a safe environment by helping to support and balance elderly, handicapped, and any other family members. Where to Install Grab Bars? Grab bars should be installed in the bathtub, shower, and around the toilet . Shower safety grab bars are typically installed on the shower wall as displayed here. A grab bar won't be much use if it doesn't hold you up when you need it most. Don't buy a bar unless it will hold up to 250 pounds, that is obtained by adding your weight AND the force you apply to the bar. It's essential that you install the bar correctly so it can do its job. You must screw the grab bars into wall studs or into additional blocking. Molly bolts, nails, or screws into sheetrock are not adequate. "Cats" 2-by-4s that you nail in between the studs, or "Plates" plywood or another substantial material that spans the wall studs, are both common practice. Can You Grab It Easily? Your grab bar should have a diameter that is 1¼ inches to 1½ inches. Many bathtub and toilet safety bars aren't designed to support a heavy weight and don't meet safety codes for people with disabilities. Consider them products strictly as an assist , do not use them to support your weight. Be careful as many bathtub safety bars only attach well on smooth, parallel bathtub sides. If you install them on a bathtub with a tapered profile or textured surface, the support brackets won't clamp as securely as they should, and the safety bars may give way when you apply a load. Available Lengths: 10", 18", 24", 36", 42"
Wave shaped grab bars, are designed for installation flush against a bathtroom or bathtub wall. Available Lengths: 24" and 36"
Call for a no obligation Price Quotation. Straight grab bars are very versatile as they can be installed horizontally or vertically and you can position them the way you want. Some people like grab bars to be vertical - pointing up and down. Other people feel more secure when they grab a bar that is horizontal - stretching from side to side. Straight bars available in 1.25" or 1.5" diameter stainless steel smooth or peened, white or almond. Available Lengths: 12", 16", 18", 24", 30", 32", 42", 48". L-shaped grab bars, are designed for installation flush against a bathtub wall, or wrapping an inside corner of a shower stall or the bathroom walls. Inside corner grab bars are installed in a roll in wheelchair accessible showers and transfer showers, to meet commercial building ADA guidelines. Inside corner safety bars are reversable for opposite corner installation. U shape grab bars are used in roll-in showers where the individual having a shower is seated in a roll in shower chair and not transfered to a shower chair. Folding or hinged grab bars attach to the wall at only one end. They connect to a hinge right at the wall. This style of grab bars, rest against the wall when not in use. When you need support, simply pull them out. Many people install these grab bars because they provide support when needed and are easily folded to be out of the way when not required. 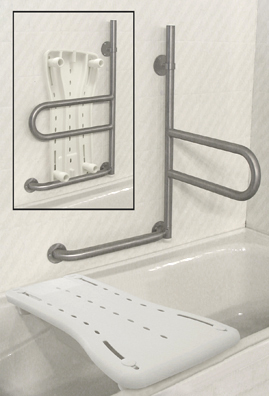 The Bath Safety bar locks every 45° (5 positions), providing a support rail that moves with user. Mounts securely to structural studs behind bathtub wall of any construction (fiberglass, plastic, tile wall, etc.). Bolt pattern compatible with WingIts® Fastening System (sold separately) if wall stud spacing does not allow for direct mounting. Bottom grab bar can be mounted for either left or right side applications. Can be installed in the bathtub or beside the toilet. Stainless steel construction provides an easy to clean, durable grab rail that can be safely exposed to water. Fixed horizontal grab bar (1¼" dia) has 1½" clearance from wall. When locked against the wall, the Bath Safety Bar is aligned with the fixed horizontal grab bar. Maximize bathing safety with a beautifully contoured plastic seating surface that includes a soap dish and handle. Fits most standard bathtub widths (15"-25"/40-60cm). Bath Safety Bar Lengths: 18" and 32"
Invisible Integrated grab bars, provide luxurious grab bars that are hidden when in plain view. Soap Dish, includes integrated chrome grab bar. 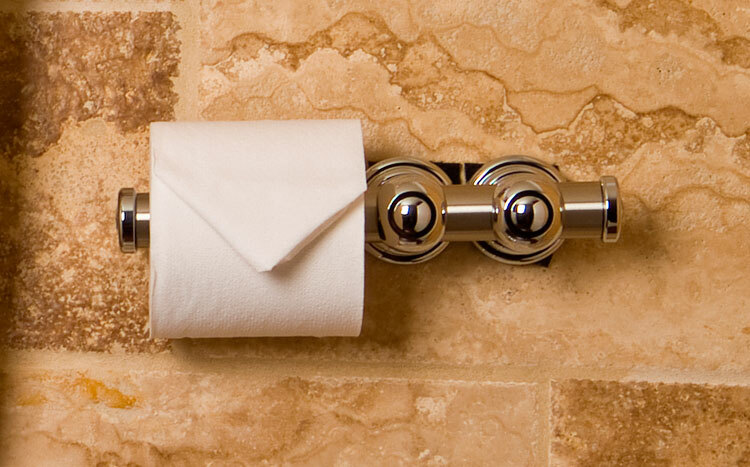 Toilet Roll Holder, and integrated chrome grab bar. Corner Shelf, with integrated chrome grab bar. Accent Ring also functions as integrated chrome grab bar. 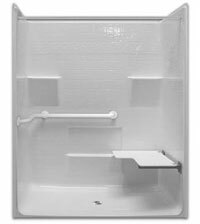 Soap Dish, includes integrated white grab bar. Toilet Roll Holder, and integrated white grab bar. Corner Shelf, with integrated white grab bar. Accent Ring also functions as integrated white grab bar. We recommend that you hire a professional to install your wall mounted grab bar(s). If you are qualified to install the grab bar(s) yourself, you should carefully follow the instructions provided by the manufacturer. This article provides information on the proper installation and positioning of wall mounted grab bars. Never anchor a grab bar into drywall , it will not hold and you could be seriously injured. How to properly install a grab bar is to screw it into the wall studs or to blocking in your walls. If your walls don't have blocking, add it by nailing a piece of plywood into the studs. The plywood should be ¾ inches thick and 6 to 12 inches wide. A grab bar should have 1-½" of clearance from the wall. 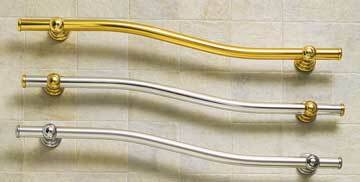 Wall mounted grab bars come in several lengths. Deciding which length to install depends on how the grab bar will be used. For example, if you're putting a main grab bar on the side wall of a bathroom tub enclosure a grab bar at least 24 inches long is best. If you're adding a second grab bar for support on the shower head wall, it should be at least 12 inches long. Horizontal grab bars offer better leverage when you are trying to get out of a bathtub or up and down from a toilet, but a grab bar placed at a 45 degree angle to the toilet or bathtub's rim is better when trying to accommodate people of different heights. Angling your grab bar has an additional advantage. A 24 inch bar installed at a 45 degree angle will exactly span wall studs spaced 16 inches apart, and you can screw into the studs on each end for maximum support. Horizontal grab bars should be located 33 to 36 inches above the finished floor around toilets, and 33 to 36 inches above the floor of the bathtub (7 to 11 inches above the rim) and close enough to the shower head wall to support you when adjusting water temperature. In addition to grab bars many seniors also utilize a walk in bathtub or barrier-free Accessible Shower. For more information see Walk-in-Bathtubs.net and Accessible Showers.